Artist and anti-war campaigner Robert Ballagh has said conflict commemorations like those now underway to mark the centenary of the first World War should be stripped of military ceremony and focus instead on victims. Two days after European heads of state gathered in Belgium to pay tribute to the war dead, Ballagh joined a number of dissenting voices in how these events should be handled and interpreted. “I am quite unhappy at the nature of commemorations that have happened so far,” he said at the launch of a booklet of essays entitled What Did They Die For? published by the Irish Anti War Movement in Dublin. “It seems to me that all the generals and all the military people have been polishing up their buttons and their medals: medals that they got for killing people,” Ballagh added. Last year Ballagh, who has been a vocal exponent of a cultural boycott of Israel, caused some debate after criticising Government plans “to balance” commemorations of the War of Independence with those of the first World War. 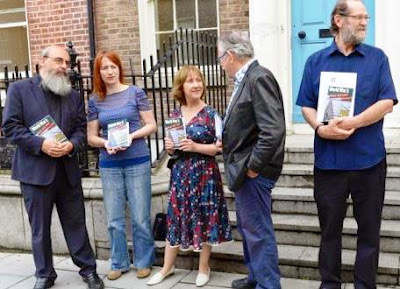 The Irish Anti War Movement booklet examines key areas of the first World War with authors Steve Woods, John Molyneux, Jim Roche and Raymond Deane focusing on how it should be commemorated, the nature of imperialism, propaganda and literature. Other speakers at the event were former MEP Patricia McKenna, Mr Moylneux, independent TD Clare Daly and the Rev Patrick Comerford, chair of the Irish CND (Campaign for Nuclear Disarmament) movement who also expressed some concern regarding the nature of events. For much of the proceedings, parallels were joined between the first World War and modern day conflicts, particularly that ongoing in Gaza. Ms Daly said the recent sign posted in Smyths toy store in Dublin’s Jervis Street – informing the public they had removed Israeli made toys, but which was later removed – was the type of action that would make a difference in the anti-war effort. Hi Patrick, thank you for a great talk yesterday in the National Library, really enjoyed it. I can't find any email address for you to send you the marriage record I spoke to you about. If you can confirm where I should send it I can explain my own family link to the Comerfords. I gave you my email address on the Obituary.